Space Master: Armored Assault is an intricate boardgame of gripping, tactical planetside combat in the far future. 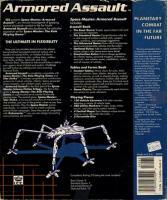 Armored Assault also doubles as the vehicular expansion set for Space Master: The Role Playing Game'. Choose Basic, Standard or Advanced Rules to define your game's level of detail and realism. Challenge yourself further by adding even more exacting Optional Rules. 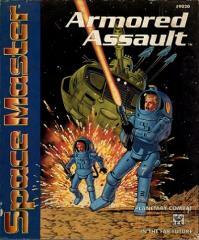 Armored Assault is completely compatible with Space Master: The Role Playing Game and Star Strike. It includes comprehensive construction systems for tracked vehicles, infantry teams, powered armor troopers, rear echelon assets, and more.